It’s a Greater Vancouver and Fraser Valley tradition that goes back 101 years to 1910 and shows no signs of letting up. The Fair at the PNE, the Pacific National Exhibition returns this Saturday and runs through the Labour Day long weekend. Every year, the fair draws almost a million visitors with returning favourites like the PNE Prize Home, Superdogs, Playland and the Exhibition Floor. Don’t forget sweet treats like fudge, corn dogs, min doughnuts and yes, even fried Mars Bars, just remember to brush and floss afterwards! For those of us who have lived in the lower mainland for a while, the classics are great but they hardly warrant long lines, pricey food and wandering the farmer’s market for the 10th year in a row. At a certain point, you need something new and exciting to get you through the gate. This year the Fair at the PNE is offering 9 new attractions that are ONLY here for 2014, plus the usual nightly concerts that feature some exciting new and classic Rock/Pop acts. 123 Dentist took a look at all this year’s new offerings and put them together for you in one, handy spot. What’s your favourite from the list below? Don’t forget to enter our Facebook Fan of the Week Contest for a chance to win a $100 Visa Gift Card, which you can use to take your family to the PNE and pay for some of that pricey parking. You’ll receive 3 bonus entries for reading this blog and choosing your favourite new attraction. Click here to enter and choose the PNE Bonus Entry option, leave a comment and you’re done! You can get additional entries by sharing, tweeting and tagging on social media. Good luck, there’s a new winner every week! Alright, we’ll admit it, this first one doesn’t appeal to everyone. There are cat people, and then there are CAT PEOPLE, and you firmly need to be in the second group to really appreciate this festival. Still, on a hot day if you’re looking to get out of the sun and take a break, these videos are sure to charm you and probably make you laugh. And of course, if you are a cat-fanatic you can meet other feline fans with the same shared interests! Need more convincing? The festival is curated by William Braden, the creator of Henri Le Chat Noir. We don’t know what that is, but cat fanciers might! A live show for the younger kids in your brood is a great way to give yourself a break. There are activities, a chance for a photo with your child’s favourite toon character and plenty of surprises too. Friendly pirates named Bones and Skully join KC Bear and other colourful characters on stage. They’ll get your kids up and moving to the sound of popular music and give you a chance to unwind. Unless they get you dancing too, in which case we apologize in advance, unless you have fun! This one actually has potential to be fun for the whole family. We haven’t seen the show, but a full recreation of Lewis Carroll’s famous book on stage with acrobatics and magic sounds like an excellent way to spend an hour or so out with the family. Just be sure you don’t end up prisoner to the Red Queen or shrunken down to the size of a small rabbit. Please note, the video above is not exactly the same show as the PNE, but it should give you an idea of what to expect. The video above should give you an idea of what to expect from this here Shindig. It’s not from the PNE, though. If you’ve never seen a live Lumberjack demonstration or competition, you will definitely want to take a peak at this romp’n, stomp’n good time of an attraction. Watch men (and women) much stronger than you do amazing, seemingly dangerous things with wood in a controlled environment. Ever seen a man juggle logs outside of a Paul Bunyan story? We have, and it’s not to be missed. Want a little more culture in your entertainment options? One of the most exciting options at this year’s Fair is Jigu! Thunder Drums of China. A live stage show with dozens of performers that has been astonishing audiences for two decades around the world, Jigu is simply not to be missed. Hailing from Shanxi, China, these world renowned musicians will wow you with a barrage of sight, sound and high energy percussion. The Mosaic Music Series is the second stage at the PNE, where some excellent performers take the stage. This year fair organizers have assembled a wonderful line up including the Paperboys, Victoria Duffield, Spirit of the West, Hey Ocean!, Delhi 2 Dublin and Tom Lavin and the Legendary Powder Blues. There’s a ton of diversity in the line-up and almost every genre in music is represented. Seating is limited though, so arrive early to save a prime spot on the grassy hill. The Fair gets one step closer to feeling like Disneyland with a trip to the ‘Get Animated’ exhibit. With contributions from Dreamworks, Walt Disney, Sony Image Works and Aardman Animation, there are no shortage of excellent attractions inside this one exhibit. This one is perfect for creative children looking for something educational and entertaining. Get drawing lessons from a professional animator, learn about Walt Disney and see some of the very first ever animated films. You can also rebuild models from popular Dreamworks films like Shrek and explore a treasure trove of original artwork. No matter what your taste, it’s impossible to ignore the enthusiasm and barrage of sights and sounds that come along with any Bollywood performance. 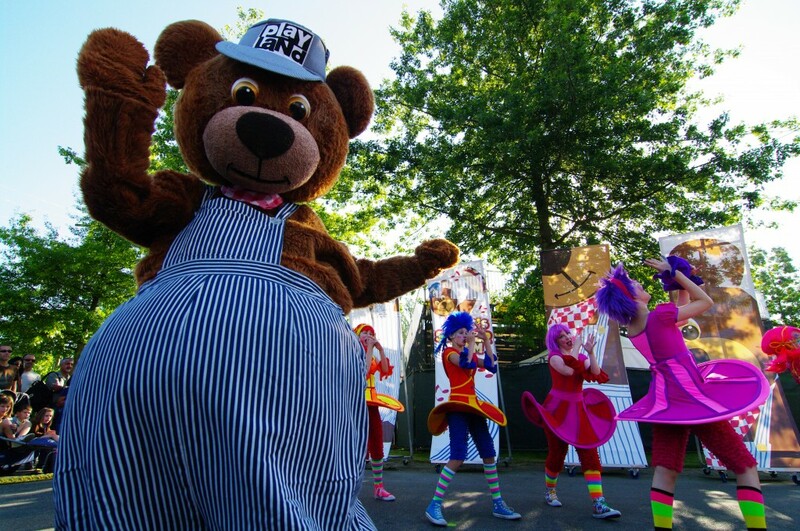 The music is catchy, the costumes are bright and those dancers are all so darn happy! Mystic India gives western and Indian audiences a chance to see and hear some of Bollywood’s most popular pieces with a large, talented cast that has been entertaining audiences around the world. Explore Rajasthan, Maharashtra, Punjab, Uttar Pradesh, and Gujarat with this world class performance like nothing else you’ve ever seen. Unless you watch a lot of Bollywood films, that is. Every year it seems the PNE ups the anti with it’s main stage show, offering popular Canadian, American and International music stars for the low price of the gate admission. This year is no exception, with classic rock pop acts Joan Jett, Trooper, Air Supply and Boys II Men. For younger members of the family, current sensations Phillip Phillips, Leann Rimes, Gavin Degraw and Three Days Grace will perform. Popular acts means limited seating, so arrive early to save seats or reserve seating at an extra cost here. The Beer Garden is always a popular choice for adults only seating, but the big crowds might obscure your view. Which musical act are you most excited for? The number one spot has to go to the decidedly un-family friendly Game of Thrones Exhibit. Find a safe way to sneak away from the kids and check out the touring exhibition. Check out the extreme detail of costumes, props and memorabilia from the hit HBO fantasy/drama, included in your PNE general admission. It’s an excellent look behind the scenes, and a great way to learn what all the fuss is about if you’re not a fan. The best part? You can sit in the Iron Throne and have your picture taken, for a price. No matter what your taste, there’s something for you at this year’s Fair at the PNE. Take the whole family and save money with public transit, a packed lunch coupons that can be found daily in the Vancouver Province. Check out the PNE’s Ways to Save Page for all the deals at this year’s fair. Good luck in those crowds!